Thank you for purchasing this plugin. The plugin is created to be used within a WordPress multisite environment. Prior to installing the plugin and therefore deploying the code, one network site/store should have been created and WooCommerce should be activated (either network activated or at specific sites/stores). You can use our plugin for an existing WooCommerce store. WordPress and WooCommerce should be updated to their latest versions. You need only the single license for this plugin to run all your shops in the network. Click browse and select the zip file for WooCommerce Multistore. Once the plugin is uploaded and installed choose Network Activate Plugin. There are a few cases when manually installing a WordPress Plugin is appropriate. If you wish to control the placement and process of installing a WordPress Plugin. If your server does not permit automatic installation of a WordPress Plugin. The WordPress Plugin is not in the official WordPress Plugin Directory. Download the archive to your computer. Extract the Plugin files and folders to your desktop (preferable). Using your FTP program, upload the Plugin folder to the wp-content/plugins directory in your WordPress online instance. Go to Network Dashboard, access the Plugins screen and find the newly uploaded WooCommerce Multistore in the list. Click Network Activate Plugin to enable the code. Any product can be replicated across the network, making it available on any other store. This is possible both with single products and in bulk. Unique product stock management for an easy inventory evaluation. Product management available at the main product and site. However, it’s possible to also update or adjust product data on other sites. You choose if the replicated product should be updated when updating the main product. Network Dashboard WooCommerce Orders panel with all domains store orders. Network Dashboard WooCommerce Products panel with all domains store products. All product meta data can be exported to other stores, including content imagery, galleries and featured thumbnails. Select any product type as Simple, Grouped, External or Variation. On the admin page, you can decide if you want the stock to be synced across all shops (if you set this to “No” you can still sync single products at the single product view). You can decide if you would like to use sequential order numbers across all shops. You can decide the minimum user role to be able to distribute products to other shops (sometimes maybe you don’t want shop owners to be able to do that). For each store, you can decide if republished products will inherit the parent product´s title, description, short description, price, category changes, tags, variations, category image and description or reviews. Orders are created in each store when a customer completes the checkout process and can from there be handled by a shop owner. The plugin also provides an unique interface through which all stores orders can be viewed, managed and processed by the network super admin. The interface is available within WordPress Network Dashboard, at WooCommerce. This use the same style as a default WooCommerce Orders area. In a multisite environment, products are published within every shop site. This interface is a simple way to manage products from all network shops, in a single place. Additional information is displayed to easily identify the product type, the MultiStore status etc. The interface is available within WordPress Network Dashboard, at WooCommerce. This use the same style and functionality as the default WooCommerce products area, including actions, filters etc. Also the plugin includes a ‘Shop Products’ filtering option which helps to display only products from a certain shop. The product network publish functionality is an easy process using this plugin. Any product within the WordPress multisite environment can be network published. Within the product edit page, a new tab called ‘Network’ is available. This contains the other blogs within the network where the product publish is possible. This also holds the information on which of the blogs this product has been already published. Any network published products are maintained through the original products, changes of descriptions, prices, images, shipping classes etc are automatically applied to already published data. Unchecking the above checkbox allows changes on the product to be preserved on any network updates. This is also available on the main network product, by unchecking the store where the data was pushed. The Unique Stock functionality is an improvement for network published products, which ensures that the fields stay the same on any store, depending on placed orders. This is available for stores that use the Enable stock management. Also the Hold Stock is applied individually depending on each store set-up. The plugin also maintains any Product Categories and Tags synchronization, as well as other custom Taxonomies. It also keeps the Shipping Classes, Attributes and Variations. This is a very powerful feature. 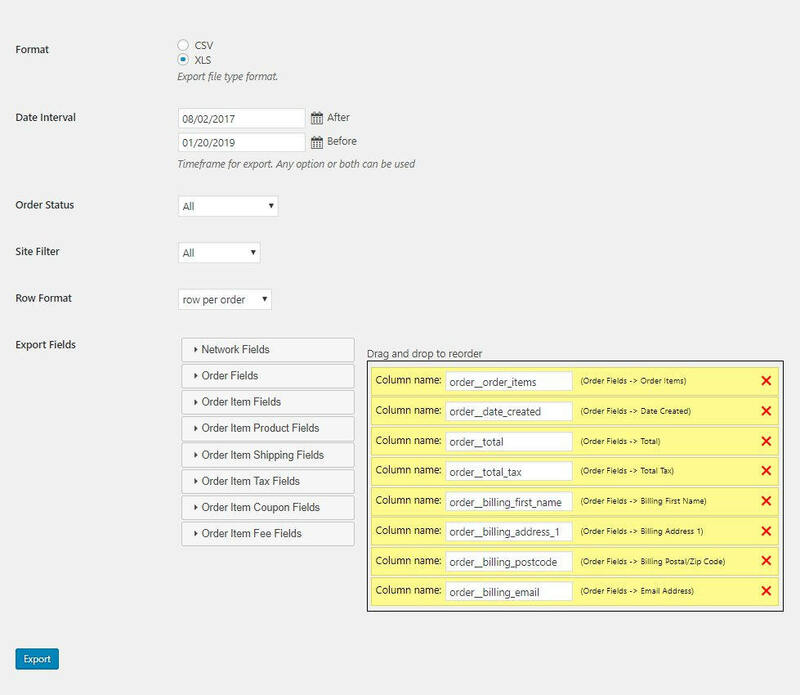 For easy order handling, you can export orders and download the orders as files. The plugin offers a fully configurable export function. Order status (incl. any custom order status). Site filter (select all the shops or any single shop in the network). Row format (row per order or row per product). Select export fields. Select any field and sort the fields by drag and drop before export.